Global Economics covers matters that concern economic phenomena that involve multiple countries. Trump Withdraws From TPP; What Does It Mean For International Trade? Author NimaPosted on January 25, 2017 Categories Global EconomicsTags current account balance, current account deficit, international trade, tpp, trade deficit, trans pacific partnershipLeave a comment on Trump Withdraws From TPP; What Does It Mean For International Trade? What’s Behind the West’s Involvement in Lybia? 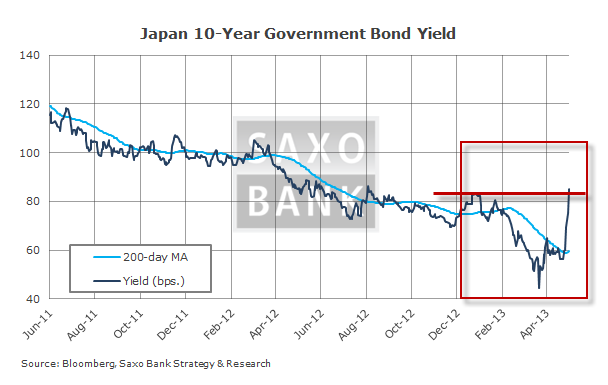 All these low rates will do is allow the debt to get even more bloated. And interest rates won’t remain low forever, as you can see in Greece and similar situations. Did people like the above author see any of those sovereign debt crises coming? What about Japan? 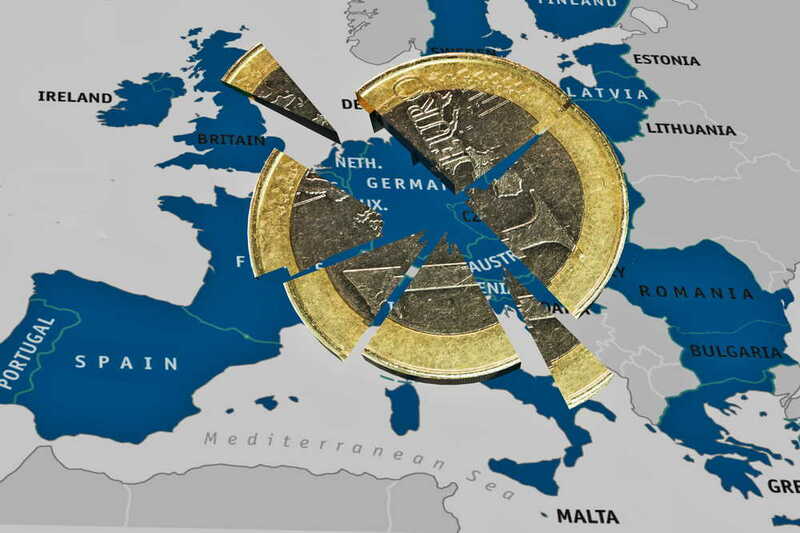 Their debt is the most crushing of all industrialized nations, and I’m predicting that their time of low rates will be drawing to an end any day now, with their debt and pension crisis having entered its final stage. Then what? As it is with statements politicians make, usually the exact opposite is true. Expect a spike in Japanese bond yields and a further collapse in their currency valuation globally, sending the Japanese economy into another long overdue financial crisis. Furthermore expect more and more of the same 30+ year long policy from the Japanese government and central bank: Money creation, debt creation, all to no avail and leaving no other option but a chaotic and painful endgame. So long as people ridicule libertarians for their “strange” ideas of sound money and fiscal responsibility, this is what they’ll get. Hundreds of demonstrators in the Iranian capital clashed with riot police on Wednesday, during protests against the crisis over the country’s currency. Police used batons and teargas to try to disperse the crowds. The day after President Mahmoud Ahmadinejad appealed to the market to restore calm, the Grand Bazaar – the heartbeat of Tehran’s economy – went on strike, with various businesses shutting down and owners gathering in scattered groups chanting anti-government slogans in reaction to the plummeting value of the rial, which has hit an all-time low this week. The devaluation of the rial and soaring prices of staple goods are the latest signs that western sanctions – targeting the regime’s nuclear programme – and government mismanagement are compounding the country’s economic woes. 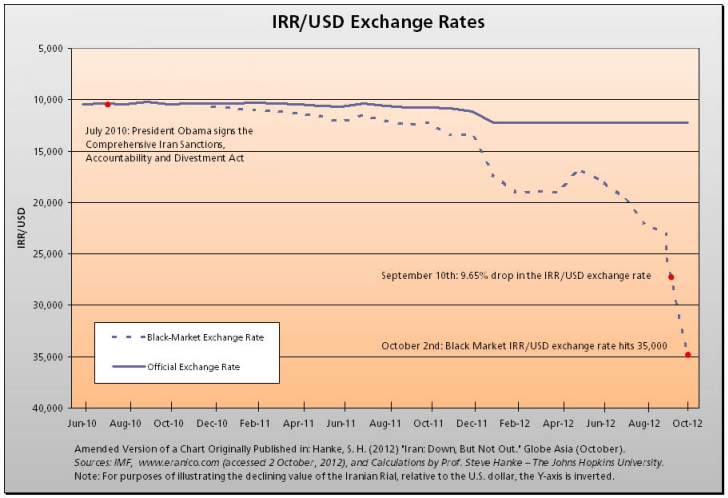 The government has failed to bring the rial under control despite several attempts. It has lost 57% of its value in the past three months and 75% in comparison with the end of last year. The dollar is now three times stronger than early last year. The economy minister, Shamseddin Hosseini, said the government planned to “gather up” the unofficial currency market in the latest desperate ditch to curb the crisis. Iran is one of the world’s largest oil producers and relies on crude sales as the main source of its the foreign currency reserves. The latest US and EU embargo on the imports of Iranian oil has affected that reserve, sending the rial tailspinning and making the dollar hard to come by. I actually remember how the Rial experienced its first significant drop in December 2011 which was around the time the stricter oil sanctions were put in place. I’d say you can even blame your higher prices at the pump these days on this policy. They have made their own government decisions – having nothing to do with the sanctions – that have had an impact on the economic conditions inside of the country. Sanctions are an act of war. They involve governments threatening its citizens, in particular its businessmen, with prison or other aggression or theft if they dare to sell to or buy from individuals in some proclaimed enemy territory. But, as we all should know by now, there is no need to look across the pond for the enemy. Does Iran’s President Want to Wipe Israel off the Map or Deny the Holocaust? Iran – Next Target in the Never Ending US War Racket?